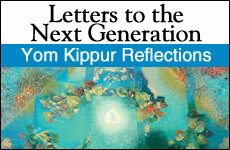 In his newly-released Ebook “Letters to the Next Generation: Reflections for Yom Kippur” England’s Chief Rabbi Sir Jonathan Sacks presents 10 letters from a father to his grown children on the meaning of life and the role of a Jew in the world. I pray that this amazing Ebook will provide a beacon of clarity and holiness for a profoundly messed up and confused world. I loved, loved, loved all of the letters in this Ebook, but this was my favorite. Guess what the topic is, Jewish moms? Enjoy and Gemar Chatima Tova! they are young will stay with them throughout their lives. Like sunshine it will make them flower and grow. Having children is more than a gift. It’s a responsibility. when you lie down and when you rise up”. would be a kind of betrayal. continue the Jewish story. That is tragic. what it takes to have Jewish grandchildren. we love, they will love. generations of Jews who were ambivalent about being Jewish. “Judaism isn’t a religion, it’s a misfortune”. We can’t live our children’s lives for them. They are free. and live in it with a sense of privilege and joy.